Silversea Cruises was created in 1994 by the Lefebvre family of Rome. The concept, and it is still true today, was to create a stand alone boutique cruise line, capable of competing with the largest and beating them. In effect it was doing much the same as Richard Branson’s Virgin Atlantic. A niche operator in a sea of mammoth cruise ships. Butler service for all. Complimentary beverages throughout and gratuities included. Daily newspapers of course. Many doubted Silversea would survive in a tough business area. They were wrong. Today it operates six ships, is award winning, is world famous, and in an ever expanding market, is setting the standard for others to follow. In 1994 Silversea got it right both in terms of what it offered by way of ships, and the on-board quality package. 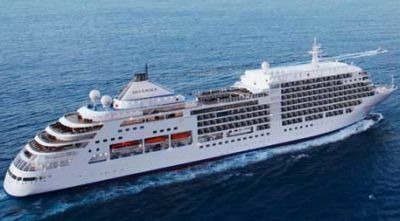 Silver Cloud broke new grounds in terms of size and onboard layout. 17,000 tons and 212 crew for just 296 passengers, the ship effectively divided into half, with the front section only for the most part containing accommodation, and towards the stern, the restaurants, various public rooms, and show lounge. With this arrangement all the suites are exceptionally quiet and room service very easily organised. Passengers can find their way around easily for entertainment, dining, bar service, shops, spa and casino. Silver Wind followed, and then two larger (382 guests and 28,000 tons) vessels, Silver Shadow and Silver Whisper. And finally, Silver Spirit, rightly sharing the name with a Rolls-Royce car of eminence. “Spirit” is 36,000 tons, has 370 crew, and accommodates 540 guests. Last year Silversea acquired a specialist Galápagos cruise ship, renamed Silver Explorer. Your Editor joined Silver Spirit at Barcelona, Europe’s premier cruise port, and very accessible from across the UK. Gran Canaria would be our final destination. easyJet fly to both and Meteor parking provided ‘meet and greet’ at Gatwick at prices hardly more than off-airport parking. Unlike the majority of cruise liners Spirit can berth at the World Trade Centre just by the Eurostars Grand Marina Hotel in the centre of the port. You can night-stop at the hotel, watch the ship come in and then causally transfer across, or check-in, take in a drink and some lunch and then wander down the Rambles in the afternoon before departure. As described above, Spirit has the now traditional Silversea layout with only the peaceful observation lounge overlooking the bow in the front part of the ship. The standard Veranda cabin internally cover 312sq ft, split into lounge and bed area with heavy curtain divider. Impressive, and not really a gimmick, are two interactive TVs built into huge mirrors. In fact the large flat screen units in the Owners Suite looked properly old fashioned. There is a full size bath tub, separate shower, and a large walk in wardrobe. A small touch, but typical of Silversea, when dining in your cabin (a comprehensive breakfast is offered, a fine 24-hour menu, or the full restaurant bill of fare during dining hours), a proper folding table comes out of a hidden alcove. The large 66sq ft balcony floor is teak. Nine pillow types are available, firm or soft mattresses and, at your service, the butler. There is a laundrette on each deck. For those who really want to indulge the 26 Silver Suites are twice the size with the lounge bigger than at home. The central pool area of the ship is large with plenty of room. No need to rush to get the best seats. Themed buffets are organised from time to time. Towards the stern are the restaurants, bars, entertainment areas and various services essential for an enjoyable cruise. There is a large library with perhaps the quickest internet facility yet found at sea. Smokers are provided for with the Connoisseur’s Corner offering a selection of cigars, fine cognacs and caviar. Whilst there is plenty of music, on board entertainment is for the most part low key. Spirit has a 340-seat show lounge where the resident ensemble performs most nights. Settees are provided. Very comfortable. You will find the entertainers helping out with tour duties and even passport control. It is Silversea’s way of creating a really family atmosphere on board. The American Cruise Director (entertainments director) Kirk Detweiler keeps his team on their toes, and he also provided a singleton cabaret one evening. Terrific. As one would expect with a company of Italian heritage the culinary experience on board is outstanding, a choice of six dining outlets offered every night. A clever piece of design is La Terrazza, fine for buffet breakfasts (or waiter service) and lunch, turning into a fine Italian bistro in the evening. The main restaurant has open seating for tables of any size and they will not shoo you out as the night lingers on. A superb variety of food is on offer and if you want something special, just ask. The Stars Supper Club is unique at sea, a small cabaret enterprise with jazz. Open in the evenings is The Grill, a sort of sophisticated cook-it-yourself (hot-rock) endeavour on the open deck, complete with vocalist. With the right (complimentary) wine, this is a fine way to spend an evening. The Seishin Restaurant (small extra fee) specialises in Asian fusion and is also open lunch times for sushi and sashimi (gratis). Also an extra is La Champagne by Relais and Châteaux, which speaks for itself. Additionally a lobby bar serves Lavazza Italian coffees, wines, spirits and pastries. Above the bridge is the Observation Lounge, an excellent viewing spot for interesting passages or a quiet pre-dinner drink. The gym has the latest electronic devices complete with individual large TV screens. Headphones are provided. The ship is not really designed for children but Paulo Percivale, our hotel manager, said that for the last two summer seasons a youth manager has been provided and proven very successful for the small number of youngsters on board. For 2013 Silversea will offer cruises of seven days or longer, mostly with at least one day at sea. Because of their small size Silversea ships can visit some of the smaller ports and bays the goliaths cannot tackle including Monaco (for the GP), Portofina (magic) and Sorrento. The ships can be found anywhere in the world during the winter but concentrate on Europe in the summer, except for Silver Shadow (382 guests) which is based at Vancouver for ‘Inner Passage’ journeys. Bargains can sometimes be found during the ‘shoulder’ periods, and for the transatlantic crossings. Much has been written and said of the late Lord (Colin) Marshall, who started his working life as a junior executive officer on P&O. He loved the oceans and became somewhat addicted to Silversea in his later years, sometimes taking as many as four cruises over 12 months. Our cruise was for 10 days, a mixture of sea days and port visits, perfect in our opinion, with plenty of opportunity to sit outside, even in the November evenings. With virtually no children on board, Silversea does not encourage them, the pool is little used. Not so the three popular hot tubs. 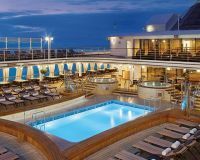 One day at sea and then to Malaga, a fine brand new cruise terminal allowing the ship to berth close by the city centre. If you want to visit the Alcazaba (fortress) take a bus or taxi. Don’t attempt to scale the heights. Even the descent was hard going. Walking around the busy shopping streets it is difficult to understand that Spain is in a greater recession than the UK. Next stop was Cadiz, the walled city once the wealthiest port in Western Europe, through which passed, Hannibal, Julius Caesar, Columbus, and the Franco/Spanish navy on their way to defeat by Nelson. Tours were organised to Seville, about one hour away (and a subject of a 2013 ON TOUR). Casablanca is Morocco’s major port, its main claim to fame the title of a ‘made in Hollywood’ film staring Ingrid Bergman and Humphrey Bogart. Some hardy souls made the four-hour each way journey to Marrakesh described as an ‘exhilarating’ city. And then another sea day kept busy with port lectures, bridge classes, the always popular team trivia (we won), gaming lessons and on this cruise an acupuncture seminar. On just that evening (and one other) the attire was formal. You don’t have to dress up. With six places to eat in the evening it is very easy to lose oneself away from the crowd. 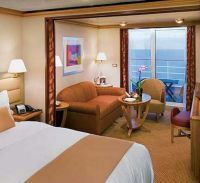 However this is a 5-star ship and guests are expected to dress as they would in a similar standard hotel ashore. Entertainment on Spirit is more cabaret than full scale, performed by ‘Artists of Silversea’, a fine professional troupe well aligned to the guests on board, youngish, no so young, and the elderly. Everyone gets along very well. The seven inhabited Canary Islands are a Spanish autonomous community and part of the EU, 75 miles off the coast of Saharan Africa. They are volcanic and host over 12m visitors a year. At just over four hours flying time from the UK they are, and continue to be, a popular winter sunshine destination. Our voyage took in Lanzarote, Tenerife, Santa Cruz de Palma (the most westerly) and finally Gran Canaria. Fred Olsen offers an inter-island tour using their frequent high-speed hydrofoil ferries. It is something to think about for the future. Cruise industry figures released by the Passenger Shipping Association estimate that 1.72m Brits will take an ocean cruise this year, 20,000 passengers more than the 1.7m carried in 2011. This has been achieved despite a challenging year for the industry following the January Concordia incident, and a protracted subdued UK economic climate for consumers that has seen market falls in many other sectors of the holiday industry. As a sign of continued confidence, nearly US$5bn has been invested globally by the industry in six major new cruise ships launched this year, and a further US$3.2bn will be spent on six more ships scheduled to enter service next year. PONZA, Italy: Visited by wealthy Italian weekenders who have homes there but otherwise unspoiled and rarely touched by the larger cruise lines. There are plenty of authentic bars and restaurants in the pretty town. DALYAN RIVER, Turkey: An anchorage attracting only the smallest ships. Take a flat-bottomed boat ride along the river, which is lined by reed beds, to see spectacular Lycean tombs cut into the rocks above, while keeping an eye out for the turquoise flash of a kingfisher. The excursion here includes a stop at a natural outdoor thermal pool with therapeutic mud baths. HVAR, Croatia: Famous among the yachting fraternity but not visited by many cruise ships, other than very small or very upmarket vessels. Hvar is one of the smartest marinas along the Croatian coast, with a great nightlife scene in summer. Stony beaches mean the water is crystal clear, with some wonderful swimming spots from tiny, pine-fringed beaches. LIMNOS, Greece: As sleepy as a Greek island as you could hope to get, with decent swimming and snorkelling and a laid-back town overlooked by an amazing ruined castle, with extensive battlements snaking over the mountaintop. MONEMVASIA, Greece: A fortified medieval town clinging to a towering hunk of rock that is linked to the mainland by a causeway. Cross the causeway and climb the path to the upper town, a maze of narrow, cobbled streets, and the fortress for amazing views. HALMSTAD, Sweden: A small port along Sweden’s Golden Coast lying amidst a maze of islands and rocks deeply indented by the sea and a favourite haunt of the sailing and fishing-addicted Swedes. MARSTAND, Sweden: Another popular sailing spot, the coast dotted with tiny, wooded islands and quiet anchorages. Setting for Sweden’s Match Cup Sailing Week, Marstrand is a small island, a ten-minute ferry ride from the mainland, and only non-motorized vehicles are allowed. It’s guarded by a 17th century fortress and is home to some surprisingly smart boutique hotels and places to eat. Ile des Saintes: A beautiful anchorage off the coast of Guadeloupe, only accessible to the smallest ships. There’s a tiny town, with some waterfront shops and bars and surprisingly chic and arty shops, and a crescent-shaped beach half an hour’s walk across the saddle of a hill. Saba: The smallest island in the Netherlands Antilles group, Saba is the remains of a dormant volcano, jutting abruptly out of the blue Caribbean Sea. This little known speck of land, with only 1,500 residents, is both remote and romantic, favoured by divers and honeymooners. Isla Iguana, Panama: An exquisite beach on a tiny island populated by frigate birds, lizards and butterflies. The snorkelling is superb and there are no facilities at all, which keeps it free from litter and tourists. Take a walk through the rainforest to the more exposed side of the island, where there’s a frigate bird hatchery.